Eve works professionally in Physical Theatre and New Circus. Most recent work has been as a stilt and trapeze artist with Circus Aotearoa (NZ), Long Shadow Stilt Theatre, (AUST), Carnival of the Divine Imagination (HK, Vietnam and AUST) and has also had the amazing privilege of training with Sydney based company STALKER theatre. For three years Eve studied at the School of New Circus, Circoarts, NZ. Graduating with specialisations in Stilt Acrobatics, Aerials (single point dance trapeze), Hula-hoops, Tight wire and Fire arts/acro-balance. 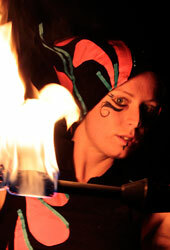 Eve is the founder and artistic director of both 'Will-o'-the-Wisp Fire Performance' and 'Long Shadow Stilt Theatre.' She has traveled internationally with these two companies to 14 countries. Prior to her circus studies, Eve also worked as an actor for nearly nine years, including 18 months on set full time with STAR TREK, paramount pictures.